Our friends arrived today! It's been 13 months since we last saw them and we are so excited for their arrival. They'll be the first ones to use our newly redecorated guest room - which includes a few surprises just for them - and a brand new super-comfy mattress that's definitely the star of the show. They'll be staying for a couple of weeks and we're hoping to log a lot of quality time that'll include food, conversation, wine, laughing, and relaxing. 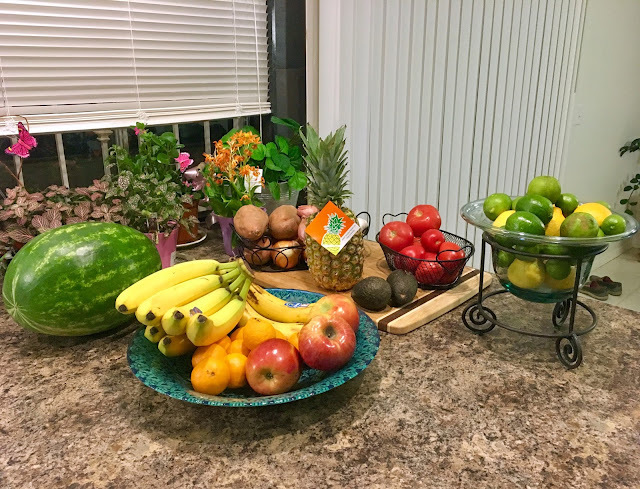 As you can see, I've stocked up on fruits and veggies, my kitchen counter exploding with color. Ed even bought a pineapple! The perfect symbol for their stay. I learned about the pineapple being the symbol of hospitality when I lived in Alexandria, Virginia. They were everywhere in that beautiful waterfront colonial town! Door knockers, spoon rests, tea towels, tote bags. You name it, there was a pineapple version of it. The rise of the pineapple as a symbol of hospitality in Colonial times no doubt came about because of its rarity. But the tropical fruit had a long journey before it found its present-day purpose as a refreshing cocktail or the ever-popular upside-down cake. The first recorded encounter between a European and a pineapple occurred in November of 1493, when Christopher Columbus, on his second voyage to the Caribbean region, went ashore to inspect a deserted Carib village. Among dense foliage and wooden pillars carved with serpents, his crew came upon piles of freshly gathered vegetables and strange fruits. The European sailors ate, enjoyed and wrote about the curious new fruit, which had an abrasive, segmented exterior like a pine cone and a firm interior pulp like an apple. Refined cane sugar and fresh fruit were expensive rarities when Columbus returned to Europe and introduced the sweet pineapple. It was an instant hit among the royal court, but it took almost two hundred years before gardeners were able to perfect a hothouse method for growing a tropical pineapple plant. Even in the late 17th century, the pineapple remained so uncommon and coveted that King Charles II of England posed for an official portrait in an act that was symbolic of royal privilege -- receiving a pineapple as a gift. In the small towns and sparse communities of the American colonies, two things worked together to solidify the pineapple’s reputation as a status symbol: sparse supply and high demand. Trade ships brought in preserved pineapple sweetmeats--pineapple chunks candied, glazed and packed in sugar, while the actual whole fruit was even more costly and difficult to obtain. Most of the fruit rotted during the hot, humid, and slow sea voyage from the Caribbean to the colonies. Only the speediest ships, aided by the best weather conditions, could deliver ripe, wholesome pineapples to the confectionery shops of cities such as Boston, Philadelphia, Annapolis, and Williamsburg. The ability of a hostess to have a pineapple adorn her dining table for an important event said as much about her rank in society as it did about her ingenuity. These beautiful fruits were in such high demand, but so hard to get, that colonial confectioners would often rent them to households by the day. Later, the same fruit was sold to other, more affluent clients who actually ate it. While fruits in general--fresh, dried, candied and jellied--were in great demand, the pineapple was the true celebrity. Its rarity, expense, and striking beauty made it the ultimate exotic fruit. Visitors confronted with pineapple-topped food displays felt particularly honored by a hostess who obviously spared no expense to ensure her guests' dining pleasure. In this manner, the image of the pineapple came to express the sense of hospitality characteristic of gracious home gatherings. The sea captains of New England traded among the Caribbean Islands, returning to the colonies bearing their heavy cargoes of spices, rum, and a selection of fruits, which sometimes included pineapples. According to the legend, the captain would drop anchor in the harbor and see to his cargo and crew. Once his work was done, he would head home, stopping outside his house to spear a pineapple on a fence post. This would let his friends know of his safe return from sea. The pineapple was an invitation for them to visit, share his food and drink, and listen to tales of his voyage. As the tradition and legend of the pineapple grew, colonial innkeepers added the pineapple to their signs and advertisements, and bedposts carved in the shape of a pineapple were a common sight at inns across the colonies. It is not surprising that this symbol of friendship and hospitality became a favorite motif of architects, artisans, and craftsmen. The Shirley Plantation of Virginia, a bastion of Southern hospitality since 1613, has a pineapple finial atop its roof, and the motif appears as an architectural element throughout the home. This tradition continues today, for pineapples are still popular motifs for gateposts, door knockers, and beautiful serving pieces.